The F82-generation BMW M4 has been on sale since 2014. There have been a few minor changes since its release, but no major overhauls to speak of. 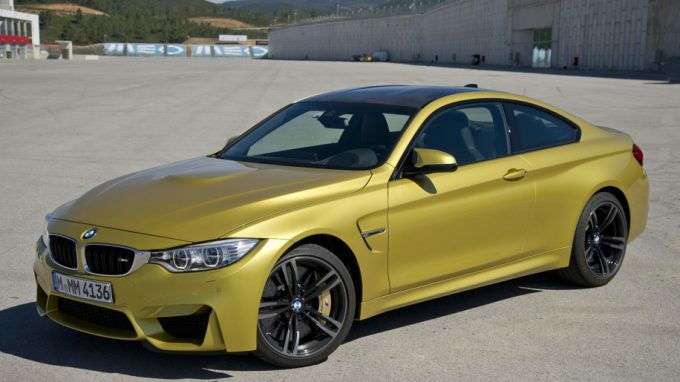 Basically, it’s a two-door version of the BMW M3 given the M4 designation to fit BMW’s current coupe naming scheme. It’s powered by a 3.0-liter twin-turbo inline-six making 444 horsepower and 406 pound-feet of torque. Power is fed to the rear wheels through either a six-speed manual or a seven-speed DCT. Our tester is loaded up with a number of options. The $4,750 M Competition Package adds adaptive suspension, 19-inch wheels and black trim on the exterior. Other options include carbon-ceramic brakes, a heads-up display and the dual-clutch transmission. Editor-in-Chief Greg Migliore: I would never buy a car this color, Austin Yellow. Otherwise, I was charmed in many ways by the BMW M4, even if it has some shortcomings. I drove a similarly equipped Audi RS5 the night before and preferred the styling inside and out to the BMW. I also think the Audi’s driving experience is a bit better. That being said, I’d look long and hard at the M4 if I were in the market for this kind of sports car. BMW’s coupes have a dynamic and a presence that is singular and engaging. The steering, which I usually tuned to Sport or Sport Plus, is solid. It’s the sharpest of this car’s quick reflexes. The M carbon ceramic brakes are tight — be careful — jab them too quickly and you’ll be pulled forward in the seat. The voluptuous styling is well-proportioned and makes a statement. I like the RS5 and Mercedes-AMG C63 a bit more for their aggressive use of angles and chrome. Objectively, those are more interesting designs. Personally, I like the M4. That’s my analysis of this segment. The Audi and Mercedes grade out better — but I think I’d put my cash on the M4 base on personal preference. Associate Editor Joel Stocksdale: Though I loved the Austin Yellow paint on our BMW M4 tester, my very first driving impressions of the car weren’t brilliant. Pulling out of the garage, I could tell the steering was seriously numb, and the first few streets I drove along revealed that the car was seriously stiff even in the softest settings. I was worried it was going to be yet another super quick car that wasn’t actually very pleasant to drive. But as I fiddled with settings and racked up more miles, I quickly warmed up to the M4. The engine is very responsive and makes an amazing howl when switched to the sportier settings. It loves to rev. It builds RPM like its life depends on it. And even though the ride is pretty rough, the flip side is that the car changes directions a split second after you thought about turning. It’s just such a quick and eager thing.